In addition to being fun to play with, shapes are a building block of early math skills and picture books are a wonderful way to introduce this important concept. 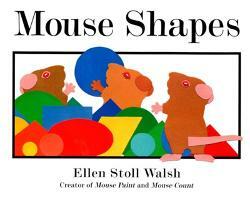 The following list contains our favorite books about shapes. 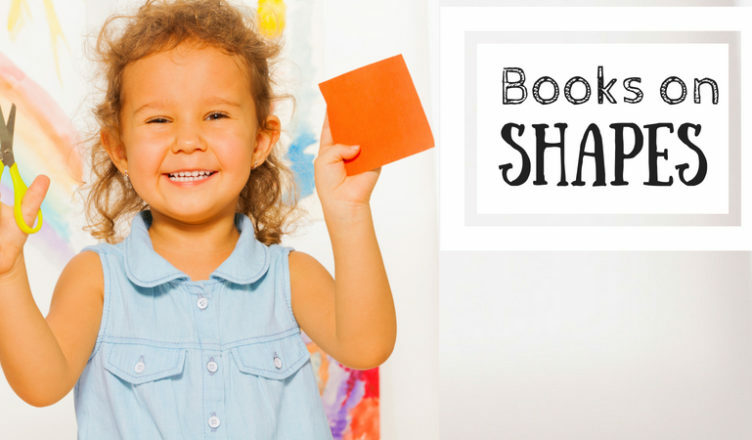 Many of the books not only introduce shapes, but also teach children that the world around them is made out of shapes, often demonstrating how shapes can be combined to create everyday items. 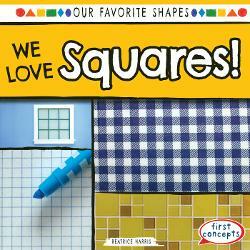 We hope you and your children have fun learning all about shapes with these entertaining and educational books. Happy Reading! When Lulu and Max discover a box of shapes, there is no end to their imagination as they combine the shapes to make common objects. Lulu and Max exude curiosity and kindness as they share the shapes with each other and work as a team while they build. Bright colors set against a white background make the shapes easily identifiable. This cheerful book is a great way to introduce shapes with young children and inspire them to experiment with their own shapes. In this classic picture book, children will be amazed to see different animals formed with a variety of shapes stacked together. With each turn of the page, a new shape is highlighted using vivid colors and die-cut pages. The final two-page spread presents all ten shapes together opposite boxes of colors making it easy to reinforce these two important concepts for children. 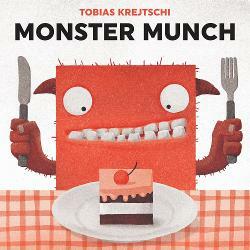 This clever book challenges children to identify which food a group of monsters will enjoy feasting upon. Children will love lifting the flap located on each creature to discover that every monster likes to eat food shaped like themselves. Circle Monster prefers tomatoes and doughnuts while Triangle Monster likes a slice of pizza and a wedge of cheese. Not only does this book introduce a variety of shapes including semicircles, hearts, crescents, and squares, it also builds on children’s ability to sort, which is an important skill. My only complaint is the that last two pages contain some toilet humor, which I am not a big fan on. My five-year-old son and three-year-old daughter, however, said that was their favorite part of the book and asked to read it again and again. 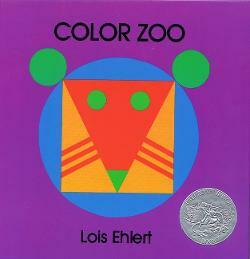 Despite my distaste for the ending, my children loved this book and it really helped my daughter learn her shapes! Walter, a determined little spider builds his web into a variety of different shapes only to be blown away by the wind each time. Finally, inspiration hits, and he combines all of the shapes to create a truly amazing web that withstands the mighty gusts of the wind. This book not only provides a terrific introduction to shapes, but also a nice lesson in persistence. This nonfiction series pairs short, simple sentences with colorful photographs of everyday items in the clear form of a shape. While I wish there was an introductory page describing the attributes of each shape first, this attractive nonfiction offering still successfully demonstrates that the world is made up of a variety of shapes. 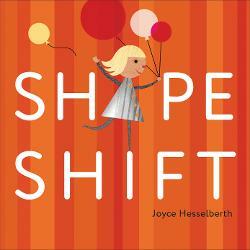 This book is perfect for promoting a shape scavenger hunt around a classroom or home. There are six books in this series highlighting the following shapes: circles, squares, triangles, diamonds, ovals, and rectangles. When three little mice hide from a cat in a pile of shapes, they discover that they can combine the shapes to make different objects. A triangle and square quickly becomes a house, while a rectangle and a triangle form a tree, etc. This book is the perfect example of learning through play. Little hands will love manipulating paper, plastic, or wood shapes to make their own creations. Younger children could simply form a design while older children can challenge themselves to make animals or objects. 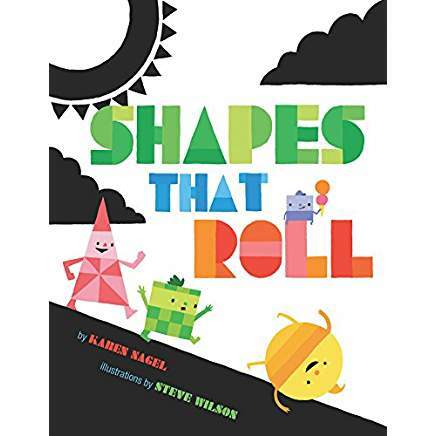 Filled with cheerful colors, rhyming text, amusing illustrations, and an action-packed storyline, this book is perfect for introducing shapes to children. A sneeze causes a chain reaction of motion that highlights each shape’s attributes. “Circle rolls, oval rocks, square sits like a box. Circle rolls, rectangle stands, triangle points without any hands.” When the circle lands on top of the pointy triangle and pops, a new domino effect occurs introducing additional shapes such as a diamond, star, octagon, and heart. The playful illustrations use color and size to highlight the shapes while the inclusion of glasses and stick figure-like arms and legs gives them personality. Parents will appreciate the shape’s fitting personas. For example, Octagon stops the chaos while Heart leads the team effort to repair Circle. 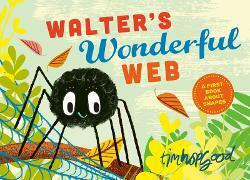 Children will delight in the beautiful die-cut illustrations of this ingenious book. Using vibrant colors that practically pop off the page, children are introduced to several shapes including circles, rectangles, triangles, parallelograms, semi-circles, ovals, and squares. 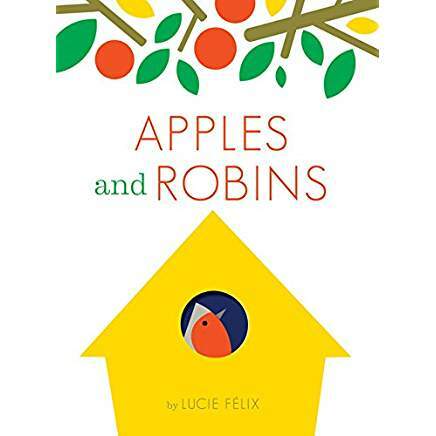 The story itself focuses on an apple tree that is the home to a family of birds. Readers will travel through a seasonal journey as the shapes are combined to create familiar objects such as apples, ladders, a bird house, etc. The transformation of the shapes by the die-cut pages gives the book a magical feel that children are going to love. This innovative book can be used to showcase shapes, colors, and seasons all while promoting the use of imagination, making this a perfect selection for preschool storytimes. *It should be noted that not all of the shapes are named, but parents, teachers, or caregivers can easily point out each one. This excellent choice for storytimes uses rhyming text to explain the characteristics of ten common shapes along with examples of the everyday items they form. “An octagon has many sides. All counted, there are eight. You see it at the corner. It tells the cars to wait.” This book is a lot of fun to read aloud and perfect for helping children become more familiar with various shapes. This inventive book introduces nine classic shapes (triangle, semicircle, crescent, trapezoid, rectangle, circle, oval, diamond, square) and encourages readers to use their imagination to see everyday objects when the shapes are combined. For example, when a boy and girl place a triangle on top of a semicircle, the girl sees a ballerina leaping through the air while a boy sees an elephant being lifted into the sky by a bunch of balloons. The final double-page spread features additional combinations challenging readers, “What do you see?” creating a perfect prompt for play-based learning. 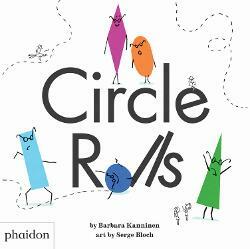 This book not only teaches shapes, but also celebrates imagination and creativity. As an extra bonus it demonstrates point of view, reminding children that there is not always a right or wrong answer. This helps encourage children to take risks without worrying they might make a mistake. Like many books on shapes, these two offerings use rhyming language to identify everyday objects made of shapes. What makes them stand apart, however, is their inside view into other cultures. 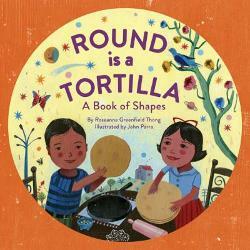 Round is a Mooncake introduces readers to elements of the Chinese culture while Round is a Tortilla shares Hispanic components. Both have a glossary in the back that further identifies the language or objects highlighted in each story. These are wonderful concept books that not only help teach children about shapes, but also the world around them. Rhyming text, bright colors, and glossy paper make this attractive offering almost irresistible to preschoolers. They will love following along as an anthropomorphic circle, triangle, and square lead them through an active world of shapes pointing out their different attributes. While many of the shapes are not named in the main text, a two-page spread at the end introduces all of the shapes and invites readers to look through the book a second time to find them. Since more complex concepts including a sphere and cube are introduced, this book is better suited for preschool or elementary-age children. 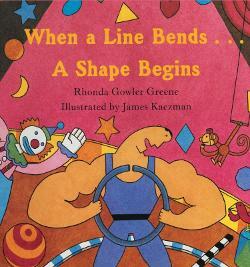 The book could also serve as inspiration for shape related activities. For example, one two-page spread notes how some shapes stack while others can roll. This could prompt an exciting science experiment for children to predict which shapes will stack or roll and then test out their hypothesis. 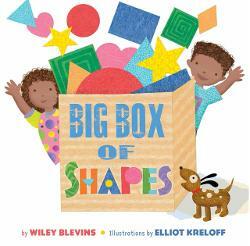 This is a fun readaloud for a kindergarten or preschool students who are familiar with shapes. Like many concept books, this one starts out showing how shapes are all around us, but the narrator is quickly interrupted by a mischievous moose. As the moose causes havoc throughout the book, the narrator becomes more frustrated and calls in a zebra dressed as a referee. 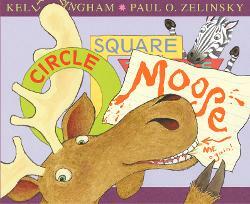 Children who read Moose and Zebra’s first book, Z is for Moose will recognize the duo right away. Those who are not familiar might be a little confused why a zebra is coming onto the scene, but will still enjoy the hilariousness of the book all the same. 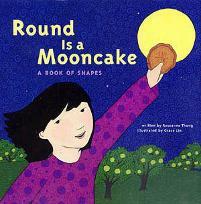 This is a perfect storytime choice for a unit on shapes.